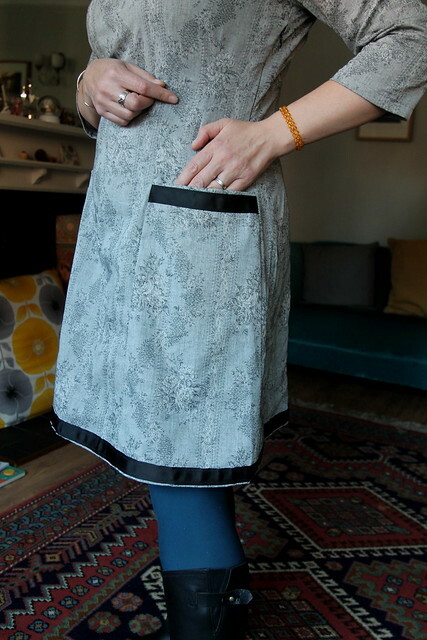 Lazy Seamstress: Maudella 5213 Fast becoming my favourite dress pattern. Maudella 5213 Fast becoming my favourite dress pattern. I don't usually make the same dress twice in a row, infact I rarely make the same dress twice, excluding toiles of course. 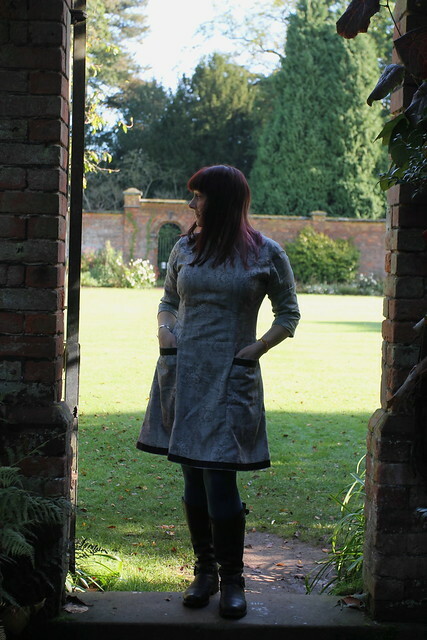 I was so pleased though with my Fall For Cotton dress that I had to make another straight away. 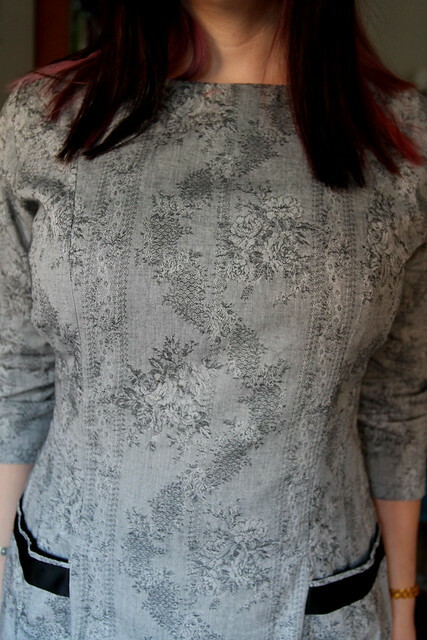 The pattern goes together so neatly and quickly with no alterations needed, but it's also so easy to wear. I love the practical three quarter length sleeves and the length and shape of the dress make it comfortable and fuss free. 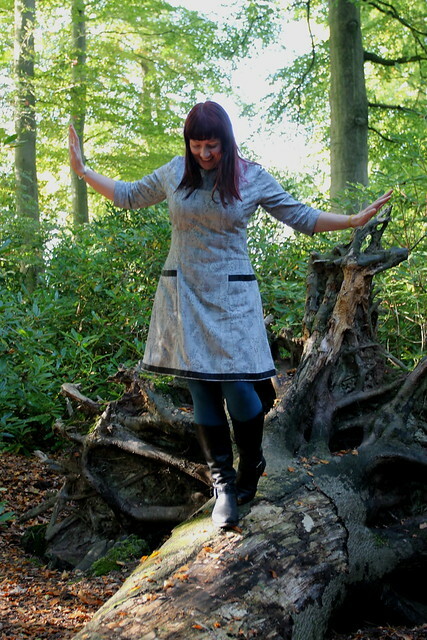 I can just chuck it over some tights add some boots and maybe a cardy, and of course there are pockets. I love a dress with pockets! 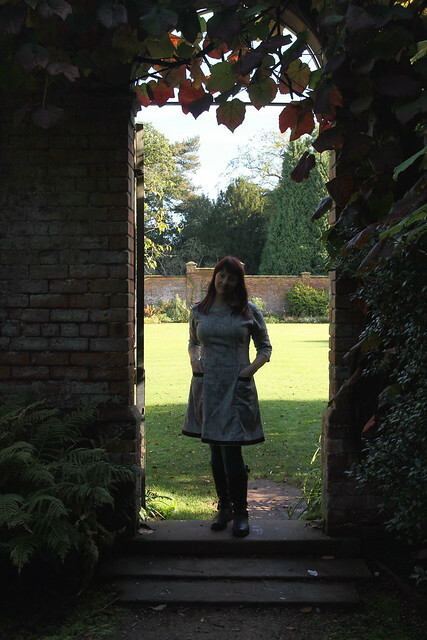 The fabric I've used for this dress is 100% cotton, and has a woven floral stripe design. I had to do a bit of careful cutting to make sure the pattern worked. I cut the main stripe design down the centre front and back panels, and ensured each side front and back were cut to match each other. I also made sure that once the pockets were complete the stripe pattern matched up on each side front panel. 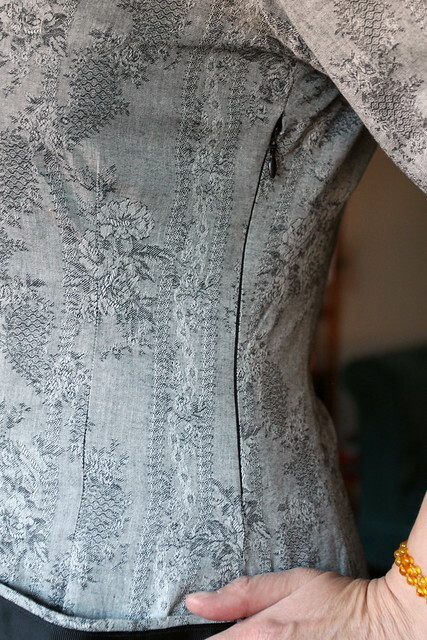 I'm almost completely happy with the concealed side zip, just seems to be a teeny bit uneven at the top. I was certain it wasn't, but this photo says otherwise. Of course one problem with 100% cotton is the creases! 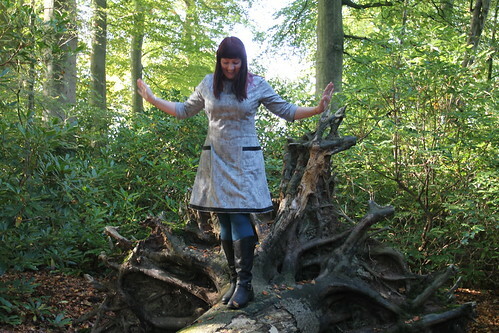 I promise you this dress was pressed, but we drove to Hare Hill to take these photos and by the time we got there I was a crinkly mess, despite being super careful trying not to move too much. Maybe I should have just worn my undies in the car and put the dress on when we arrived! That might've given the National trust employee on the gate something to look at! Hare Hill is such a lovely peaceful place to visit. We hadn't been there for a long time. I'm not sure why, it is such a pretty place. The drive in was interesting as a herd of cows were blocking the path, many of them only calves, and so so pretty. Wish I'd managed to get some photos of them, but I didn't want to spook them. Woody was mostly in charge of the camera anyway, so I was snapping away with my phone. 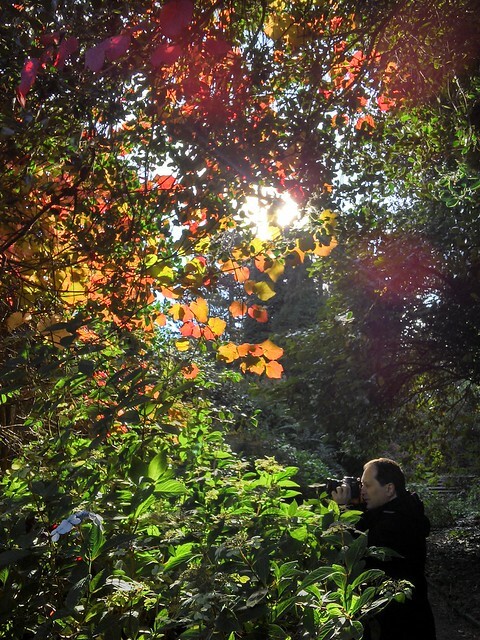 I managed to get this lucky shot of the sun coming through the autumn leaves. 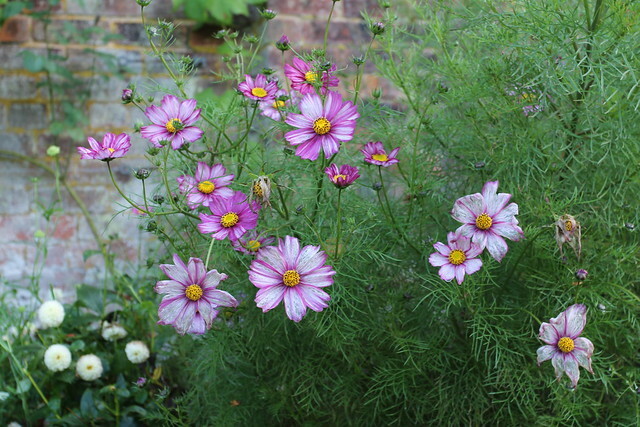 And when I did get hold of the camera managed to grab a few shots of the flowers in the walled garden. Sadly, we only had a brief walk. Angus and Sid were reluctant to even come along, and had already been bribed with cake, but their patience (and mine!) was running low, so we left before everyone got cross with everyone else. Woody and I have made plans to head back there soon though, this time with a flask of hot chocolate and without the grumpy children! 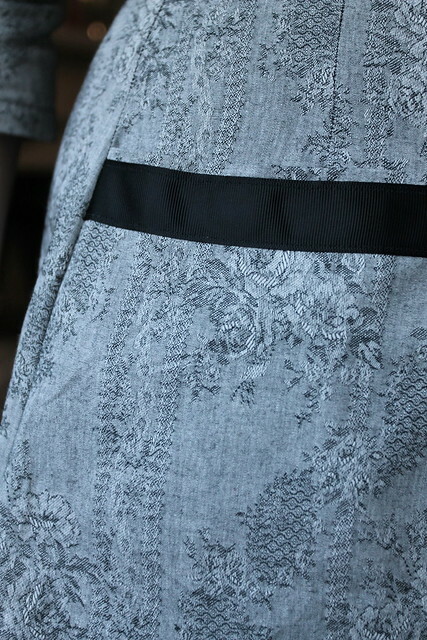 The dress is gorgeous and fits you so well, you will have to start collecting Maudella patterns since this one fits like it was designed for you. I wish I had to skills to make things for myself, maybe I could at least make myself some interesting tops to wear with my boring jeans.